Ages 9 and up. 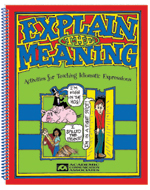 Each activity in this book focuses on a common idiomatic expression. The literal meaning of the expression is represented in a humorous 8.5"x 11" illustration. Sentences and short stories are presented to illustrate use of each idiom. The activity worksheets relate to the content of the short stories and to the meaning of idiomatic expressions used within the stories. The humorous pictures make learning fun. A downloadable version of this product is also available. Select the RELATED PRODUCT link below to view..